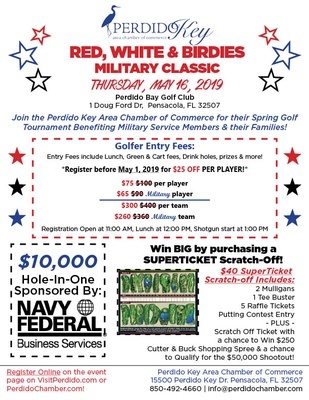 Join the Perdido Key Area Chamber of Commerce for the Red, White & Birdies Military Classic, Benefiting Military Service Members & Families and the Perdido Key Area Chamber of Commerce! The golf tournament will be held on Thursday, May 16, 2019, at Perdido Bay Golf Club.. This Military Classic is only $100 per player and $90 for the active or retired military. The registration fee includes your lunch, green fee, cart, range balls, and numerous drink holes! Check-in will begin at 11:00 am, lunch at 12:00 pm and a shotgun start promptly at 1:00 pm. Players can also register for mulligans: 2 for $10 per individual, purchase raffle tickets to win some amazing raffle items, and try for a chance to win at a 50/50 raffle! Sponsorship Opportunities are available! View our Sponsorship levels here!